I’m a few days behind but I did the work, it’s just that this post got postponed a bit. Orlindo just shared his second status update on #ProjectMomentum which means it’s my turn again. So, let’s crunch the numbers. One Book: I recently finished World War Z by Max Brooks and for work I’m rereading The Ocean at the End of the Lane by Neil Gaiman and The Curious Incident of the Dog in the Night-Time by Mark Haddon. Rereading The Ocean at the End of the Lane reminded me how great a writer Gaiman is and the book actually might help me with Orlindo’s idea. Some of my comments in our last exchange were heavily influenced by Gaiman’s book. But #ProjectMomentum is about screenwriting so I should start reading screenplays again. Thanks to Weekend Read by my favorite blogger and podcaster John August reading screenplays on an iPad is a breeze. Even “breeze” is an understatement, you don’t have to leave the app to download great screenplays. So I started with Star Wars – The Force Awakens and I have to say, it was a good read. I especially looked at character introductions and the action beats. I love how Rey is introduced, through action and not through dialogue but my favorite bit is how the screenplay portrayed Finn, from “OUR STORMTROOPER” to “FN-2187” to “FINN”. It’s a tiny detail but I guess that’s what people call craft. Next up “Before Midnight” and after that I think I should read a german screenplay. Two Movies: I watched more than 2 movies but I want to mention two of them that stuck with me. 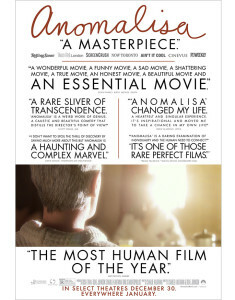 First off: Anomalisa. I went in cold, I only knew that Charlie Kaufman made an animation movie and boy did he deliver. It’s like nothing I’ve seen before but the biggest take away is, that some stories just demand a specific art form. I can’t imagine this story any other way. The second movie was “Me and Earl and the Dying Girl“. I read the book with my students and the movie is just wonderful, if you like funny movies about cancer. I don’t know If Orlindo has seen this movie but It might be a good idea foe him because the vibe would fit his story as well. A bit whimsical but emotionally honest. Seven pages: I’m on it. I’m typing and deleting. There are a few screens I need to get on paper but after that it’s back to the drawing board. I need to figure out what the story is about. If writing a screenplay is like carving a statue, out of stone I’m currently pouring concrete into a rock shaped mold. Seems lie I have to wait before I can start chiseling. Seven hours of development: I read Orlindo’s outline and gave him some feedback and commented on his feedback to my feedback. We’re using Evernote for our development process and so far I rally like it. It’s nice to have everything in one place, sending emails back and forth is ok but it gets confusing after 15 emails. I hope I could give him some valuable insights and/or nudges into different directions. I can see what he is going for and the story starts to take shape and I’m confident that he’s close to the moment I talked about in my last post. Like Anomalies, some stories just want to be told a certain way and I hope that our stories will reveal themselves to us rather sooner than later. So let me end with my music tip for the week: Fargo TV Soundtrack by Jeff Russo. The Main Theme is just beautiful.